even with the correct 450 C we would arrive at - 50 C and even that I found hard to believe. Developers will hopefully soon fix this temperature problem with Venus. Thanks for reporting this. It looks like Venus is starting at the wrong temperature. If you load Home > Open > Solar System and start it paused, you'll see that the temperature is as you reported. But if you unpause it, you'll see that it quickly jumps to the correct temperature. In other sims where the time step is lower, like in the Real Time Solar System, it takes a bit longer for the temperature to rise to the correct ~470 C. I'll report this to the team. So even with incorrect start value of the temperature the simulation then arrive to the correct value ? Does this mean that the program can correctly calculate a planets surface temperature given data about its atmosphere and distance to a the central star with known data ? Yes, there is a generic temperature simulation for all rocky planets (besides Earth and Mars, which use a separate climate model). You can see the factors in the Temperature tab of the planet's Properties. I hope that planet grids will fix the problems with temperature for Venus and all other planets as well. How does the generic simulation work and what is its limitations ? How does the simulation for Earth and Mars differ from the generic one ? You can also check out the climate tutorials in Home > Tutorials > Science. Essentially, if you just compare the properties that are shown in the Climate tab for Earth and Mars to any other planet's Temperature tab, you will see what factors are simulated and which are not for each. Today, I have noticed that Venus has the wrong texture because it looks too green. Venus must be re-textured to make it look like the real Venus. My choice is to see objects in Universe Sandbox ² as I would see them with my eyes from a spaceship. Maybe Universe Sandbox ² could give us a option to see with human eyes or radar eyes. The clouds of Venus should be shown in Universe Sandbox 2 as exactly as they look like in real life when the atmosphere is shown on Venus in Universe Sandbox 2. To see the real surface of Venus in Universe Sandbox 2, you need to hide the atmosphere. The color of Venus's atmosphere is too green, so its wrong. It's atmosphere should show whitish clouds with a more orangey atmosphere as it does in real life. Please update the color and texture of Venus in Universe Sandbox 2 to reflect how the real Venus looks like. Did you watch the video link I posted above? Yes I saw the video link you posted. I believe the picture of Venus it shows came from radar scans. Radar pictures don't show colors, they show the altitude of the surface of the planet. Then any color can be applied to the resulting picture. Have you looked at Venus through a telescope? It looks very white. I never seen Venus through a telescope. Please make sure that the developers chance the color and texture of Venus in Universe Sandbox 2 to reflect the real Venus. I really like the real photo of Venus on Wikipedia because it displays Venus with its real color and clouds. That how Venus should look like in Universe Sandbox 2. The developer must update Venus with a new color and texture. One thing to consider here. Could these photos have been taken using some kind of filter ? Do they correctly show what a human eye would see ? It appears that these NASA photos does not have a filter. To be honest with you, those NASA photos of Venus don't have a filter. This is the real color and texture of Venus. NASA does use filters to take photos. The cameras take black and white pictures with filters and then combine the pictures to make colored photos. To make photos that look like what we see they use red, green, and blue filters. They take the black and white picture taken through the red filter and color it red, the picture taken through the green filter gets colored green and the picture taken through the blue filter gets colored blue. These three colored pictures get combined together and show a picture that looks like what we would see with our eyes. To show other detail they can use infrared or ultraviolet filters to show things that we cannot see. These are a black and white picture but are sometimes artificially colored to make them look better. "This view of Venus was composed of images taken through red, green, and blue filters by MESSENGER on June 5, 2007 as it approached for its second flyby. 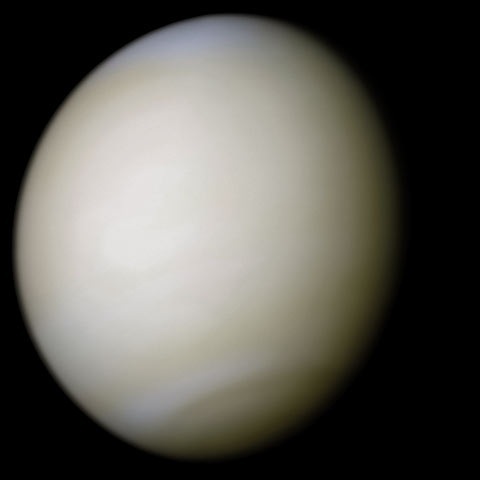 Seen in natural color, Venus is nearly as featureless as a cue ball." I understand, but NASA does not always use filters. I know that, in general, NASA uses filters, especially for zooming on stars. For planets like Venus, NASA uses filters to see it in infrared or ultraviolet but sometimes NASA does not use filters at all to see planets like Venus. Cesare can you find a NASA picture of Venus that was taken without a filter? Yes, I have managed to find a transit of Venus passing in front of the Sun. And can you see the real color of Venus in this photo? I would say no. I'm pretty sure Venus isn't that dark...since it's the silhouette. Against the sun. Also, I'm pretty sure the currently simulated colors are mostly correct. Maybe a slight bit too green but if anything, it looks better than if it were the same color all the way into the shadowed side of the planet. No. It is not the real color of Venus. This photo only shows a transit of Venus passing in front of the Sun. Let's go back to the point. Venus must be re-textured and re-colored in Universe Sandbox 2 to make it look exactly like the real Venus. .... Also, I'm pretty sure the currently simulated colors are mostly correct. Maybe a slight bit too green but if anything, it looks better than if it were the same color all the way into the shadowed side of the planet. I know, but it still looks too green.